In the first quarter of 2018, the PAYCE® score was added to the CreditRiskMonitor service. This proprietary credit model uses deep neural network modeling technology, a type of artificial intelligence, to measure private company financial stress and bankruptcy risk. The PAYCE® score provides a rating on businesses that are not currently assigned a FRISK® score, offering more comprehensive coverage for CreditRiskMonitor subscribers. The PAYCE® score currently delivers ratings on about 80,000 private companies and, notably, identifies risk with a 70% rate of accuracy. It is critical to manage the financial risk of your counterparties, yet it can be difficult to retrieve financial data from every business with which you are dealing. Therefore, risk professionals most often benefit by having an automated system in place to stay ahead of trouble. The PAYCE® score will assist with this process. Since the PAYCE® score can identify stress within private companies, users will know when to dig deeper on a customer or supplier. Furthermore, the PAYCE® score can also be compared to the ratings of other credit reporting companies. An agreement between other ratings and the PAYCE® score will provide confirmation as to whether a given company is risky or not, whereas a disagreement may require further investigation. The PAYCE® score currently delivers ratings on about 80,000 private companies. The sources and quality of the data used in the PAYCE® score are critical to the model's accuracy. The data is chiefly derived from two sources, which are collected through the CreditRiskMonitor service. The first is trade payment data. Our Trade Contributor Program provides businesses with a variety of unique benefits related to trade, primarily for the purposes of managing risk. Currently, our trade contributors provide our company with more than $130 billion in receivable data every month. For the PAYCE® score’s neural networking model, a minimum number of trade lines of a company’s payment data are required for submission to be considered, which makes the score more comprehensive and reliable than traditional payment scores. The second data factor used is public filings, specifically U.S. federal tax liens. These claims are a distinct risk signal, as they effectively mean a company has defaulted on its tax debt. So by having payment data and public filings, the PAYCE® score generates a consistent and highly accurate result. All things considered, we believe that the PAYCE® score is a superior private company scoring model for identifying financial risk. Both business-to-business customers and suppliers should always be watching for private company bankruptcies, given that they occur so often. 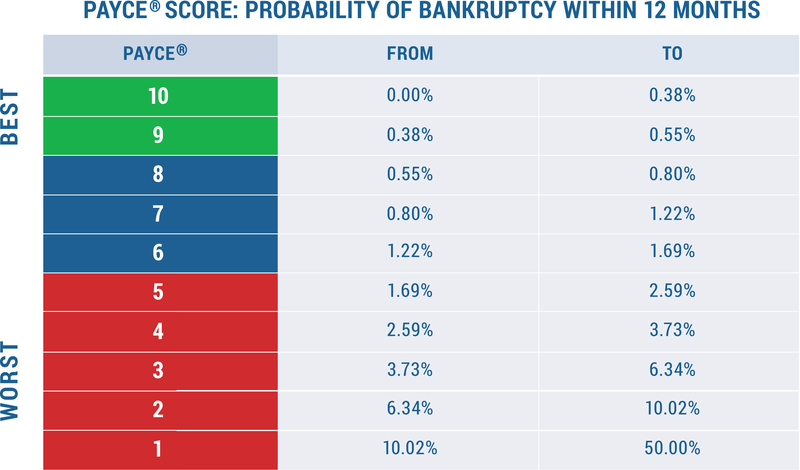 In the short period since its introduction, the PAYCE® score has already identified many private company bankruptcies. From these instances, we can discuss a few recent bankruptcy cases to illustrate the warning that subscribers would have received. Below we provide comparisons to the "days beyond terms" (DBT) Index. The DBT Index is a measurement of payment delinquency, expressed as the average number of days by which a subject company’s payments are past due. CreditRiskMonitor's DBT Index is a dollar-weighted measurement of this payment performance, and after we calculate the number of days we convert it into simple range labeled from "1" (worst) to "10" (best). Broadly speaking, the DBT Index provides a historical snapshot of a particular month. It is designed to provide a simple descriptive summary; it is not designed to be predictive, and because it is dollar-weighted to accurately describe overall payment performance, it may place emphasis on how a company pays its largest suppliers. The PAYCE® score is different. It is designed to give users a forward looking risk assessment. Unlike some scores which are predictive of slow payment, the PAYCE® score measures financial stress using bankruptcy as the target. Several months before the DBT Index indicated poor payment behavior. About one year in advance of each respective bankruptcy filing. First up is Puglia Engineering Incorporated. This west coast ship repair company was a severe risk. For nearly one year, the PAYCE® score was trending in the lower end of the high-risk "red zone." This trend effectively showed that the company would have difficulty making future payments. The DBT Index indicated poor payment behavior, where a noticeable decline occurred between June and August of 2017. In fact, the PAYCE® score signaled material financial stress approximately 11 months prior to the company's bankruptcy filing on April 14, 2018. Next is A.J. Bart, Inc., a commercial printing company. The PAYCE® score predicted a high risk of financial stress for several months prior to the company's weakest payment behavior. The visual speaks for itself, where the PAYCE® score highlighted A.J. Bart, Inc. as a threat at least six months before the DBT Index did. It's important to note that a decline into the bottom three scores ("1" to "3") is a particularly high risk warning. Following that trend, the company filed for bankruptcy on April 3, 2018. The last example is Traco Production Services, Inc. Traco is a supplier of products and services for the oil and gas industry; an industry still showing high levels of financial distress. Over the period, the company's PAYCE® score displayed a clear downward trend, incrementally declining from a "6" to a "3." Here, the PAYCE® score signaled that risk was increasing and it did so for months in advance of the DBT Index reaching worrisome levels. You can see the benefit of using a predictive score. The company later filed for bankruptcy on March 16, 2018. Financial professionals should monitor all of their counterparties, and focus their efforts on those posing the most risk to their own business. Bankruptcy risk is always lurking, and it can strike today or a few quarters from now. Plus, companies can become unreliable partners many months before they might actually fail, due to severe financial stress. The PAYCE® score will help manage risk by identifying private company financial stress when financial statement data is unavailable. In the three examples mentioned above, the PAYCE® score predicted a high risk of material stress in advance of each bankruptcy filing. A simple, 70% accurate score spanning approximately 80,000 private companies will help professionals to proactively and conveniently stay ahead of counterparty financial risk.